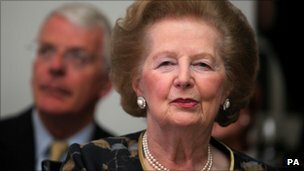 Former Prime Minister Margaret Thatcher has claimed £535,000 of taxpayers’ money over the last five years, government records have shown. Baroness Thatcher, 86, who makes rare public appearances and suffers poor health, was paid from the public duties cost allowance available to ex-PMs. Others to benefit have been her successor John Major, paid £490,000 in the last five years, and Tony Blair. In 2008-9, Mr Blair claimed £169,076 – more than his Downing Street salary. Since leaving office, Mr Blair, who ran the country for a decade from 1997, has claimed just under £273,000. The system was set up by John Major in 1991, after one year in office, to reward former prime ministers for work including answering letters and attending public events. In the past five years, the three former number 10 incumbents have cost the taxpayer in total more than £1.7m in public duty allowances. The figures were revealed by Cabinet Office minister Francis Maude following a written Parliamentary question from Tory MP Philip Hollobone. In 2005, doctors advised Lady Thatcher, who served three consecutive terms in office, that she should not make public speeches in the wake of some minor strokes. But she still attends some public functions, including an address by the Pope during his state visit to the UK last year. In September, she attended a party to mark former Defence Secretary Liam Fox’s 50th birthday at his London apartment. Meanwhile, Pinhead of the Month is Cllr Nick Clarke, the Tory leader of Cambridgeshire County Council. At a council meeting earlier this month, Cllr Clarke led moves to increase councillors’ allowances by an eye-watering 25%.Only four of his fellow Conservatives voted against the rise, which will increase councillors’ allowances from £7,610 to £9,500 and Cllr Clarke’s own package from £29,856 to £38,000. The changes will cost Cambridgeshire council tax payers an extra £166,000 a year. Not good at a time of cuts to services.